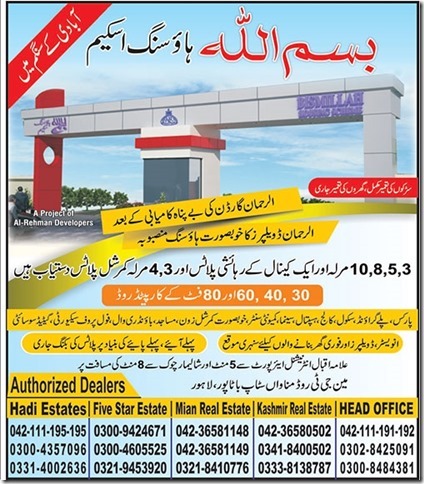 Bismillah housing scheme in Lahore near Bata pur is recent and on going residential project by Al-Rehman developers. This housing scheme offers various sizes of 3 Marla, 5 Marla , 8Marla, 10 Marla and 1 Kanal residential plots and 3 & 4 Marla commercial plots on installments and cash payment. Booking is still open for all sizes of residential and commercial plots on first come first served basis. Developers claimed that project have all basic amenities and facilities. Bismilalh housing scheme in Lahore is located at very good location . Project is located at main G.t road near to Banks stop Manaawa . This housing scheme is also few minutes drive away from Lahore international air port , Lahore ring and DHA phase 8 Lahore . Roads, Streets and main boulevard. Main G.T. Road Bank Stop Near BATA Factory Manawa Lahore. I am looking 4 marla plot in block A. If available please do let me know. still booking is available ? Can you please provide 5 & 10 Mirla residential plot detaisls. cash and installment plan both details. Dear. please tell me about its installments if possible. Pl give me detail of 5 marla plot price , net paymet and also instalment. I am looking for commercial plots from 5 to 10 marla. Please aware me about such availability, with price. please give me detail of 05 &10 marla plot payment schedule,thanks.